From Manischewitz to iPhones: Two of the world’s most famous octogenarians chat about the trials of aging, the wonders of the Internet, and whether aliens exist. Plus, an impromptu wine tasting! And bagels! William Shatner stops by to talk to Larry King about his one man show. It was available for a one day screening on the 24th of April. 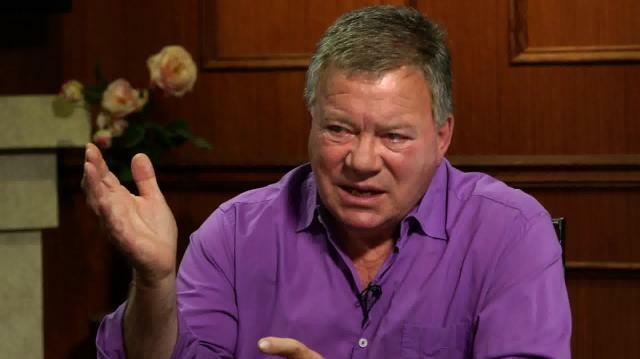 Shatner's World is "an evening with me", The legendary actor says. "Don't go because you don't know,"
The 83 year old says that he thinks more about dying as he gets older. "Don't go because you don't know," Shatner jokes as the two men talk about the afterlife. When it comes to the future, he talks about climate change as one of his main concerns. The actor-turned-author worries about the pollution in resources over the upcoming years. His new book Hire Yourself touches on the unemployment rate and the effect it has had on people over 55. It focuses on ways for his readers to effectively advertise and advance themselves while on the internet. When he is asked what he is working on, Shatner reveals that he is working on a documentary called Wacky Doodle, the story of making Star Trek: Next Generation. How did the writers come up with a show without conflict? Shatner says that he didn't know Gene Roddenberry well, though he found him interesting and complex. The show went on to become a huge success, was on the air for seven years and became the first television show to go into syndication. Shatner's sci-fi novel is based on John E. Mack's story. He was a tenured Harvard professor that interviewed several abduction victims and concluded that they were right. UFOS as part of another reality or plain were Shatner's inspiration for his novel. However, he doesn't know whether he believes in their existence. The interview finished up when the actor breaks out the wine and explains how he uses it as a conversation starter, ending on a high note as he describes a bagel in Shakespearean terms. "Thou has bespoken to me of greatness," Larry King remarks.